Martin HD-28 (2018) and About Time Too! The NEW Martin HD-28 (2018) has pre-war looks and forward shifted bracing! Since the mid-1990s people have said Martin’s Standard Series guitars should have the looks and sound of the Vintage Series guitars, especially those who kept saying, “I’d buy one if it didn’t have the V neck.” Well that is pretty much what has finally happened. So here ya go, Ladies and Gentlemen get your wallets ready! The written review will follow in time, I am putting out the videos first this year, at least for Winter NAMM. A reader asks about scalloped bracing and the tonal differences compared to straight (non-scalloped) bracing. 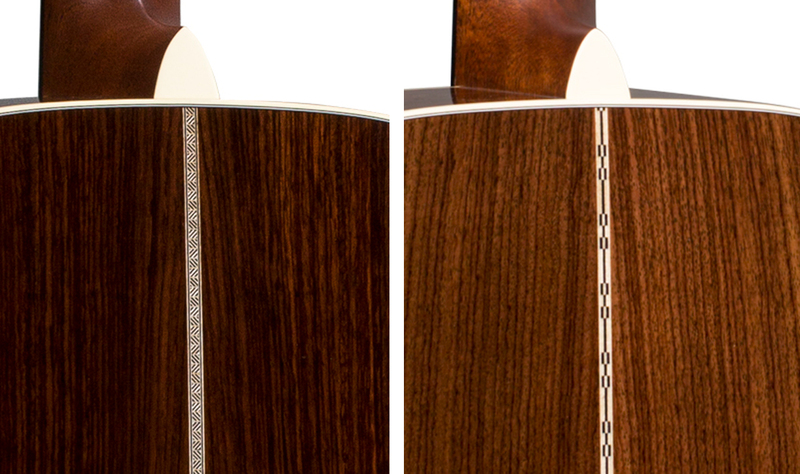 I always wonder about straight vs scalloped bracing over time/aging, especially on Martin dreadnoughts made of Indian rosewood and Sitka Spruce. I read some people saying that over time straight braced guitars will open up and have bigger bass, and it’s just right, not too big, not too tight. (Thinking, for instance, of the D-28). Is this right? What about the scalloped bracing will turn over time? Thank you! All such guitars will open up. And the inherent tonal properties of each will increase as time goes by. I have often been around a 2000 D-28 and a 1990s HD-28, and often in the same room at the same time. It makes for an obvious and enjoyable comparison. The HD has a much more echoing cavern kind of tone under more precise spider web trebles and a bass E string that has a lot of thunk to it, which seems directly connected to the undertone. The D-28 had string notes that are more solid and sit up on top of the undertone with a lot of clarity, like each note is a well-shaped log laid out on top of a thick slab with only the underside of each log resting upon that thick undertone cushion. The undertone presence comes up to them, but does not swamp them. The trebles are thicker relative to the HD spider webs, and the bottom bass string stays very well defined, There is a discernible edge to bass end of the voice, and it does not thunk in the same fat unfocused way the HD does. The HD does not have an edge to the bass end of the voice, but is more diffuse with no clear horizon. I used to like the straight braced sound, but found the scalloped bracing dread sound too reverby, with notes that did not stand out with the same strength and were embraced too much by the undertone. In fact, I was the original owner of the D-28 mentioned above. I have come to love the scalloped dread sound a lot. But I really like it best as a solo instrument. I love how the straight braced D-28 has such a uncluttered clarity in ensemble playing, the individual notes are like little pen lights in all that sound of guitar, accordion, bouzouki, etc. The HD sounds more like each note has a warmer halo around it and meshes more into the mix and the low E sounds more bass player throbbing and not as cut and defined. However, I like them both and love the fact they sound like siblings with different personalities, and they sound best of all when playing together.